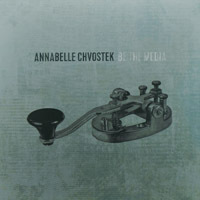 The Juno-nominated singer/songwriter from Canada Annabelle Chvostek explores with her fifth studio album "Be The Media" a new, rocking terrain. With an electric 1957 Kay guitar, whose sound pervades the entire album with its character, she has spent two weekends - live in a trio accompanied by Jérémie Jones on bass and Tony Soina on drums - in the New York studios of the production company Beehive Pro. In the title song "Be The Media" consciously some kind of urban disharmony are provoked by differences from the clean sound. Annabelle Chvostek tries a change from previous Folk/Roots genre - the warm bass rumbles and impulsive drums prance nervously, the voice slightly out of tune and in the chorus like an accusation. It triggers a bit of déjà vu and reminds the break, when Suzanne Vega in 1992 released her album 99.9°F - away from the warm harmonies like in "Solitude Standing" towards the experiment of a weird-entertaining ambience. "Jerusalem" follows as lyrical, slowly walking ballad, in which an oriental-Jewish sounding violin sets the emphasis. A very harmonious and beautiful song, sung with a lot of narrative expression; reminding a little bit of the British melancholy of Anathema. All the more strange looks "Black Hole" just after it, an experimental sound collage assumes slowly growing structure and in its increasingly dramatic boost occurs a musical saw with pitched curves. The song invades areas of avant-garde rock, held together by clear, slightly metallic Grace Slick-like vocals and thus reminds of early times of Jefferson Airplane. Then "This Night" you can almost call bluesy-jazzy, before the charming "Carnal Delights" will sound, flash in winking fragments of some glamour fairground melody, and the singing saw with her spine-tingling vibrations trembles again. "You Can Come Down" relaxes as a beautiful, melancholic country-folk ballad. "Like A Hurricane", unmistakably a cover of Neil Young´s classic, is wonderfully atmospheric interpreted, marked by a mandolin and a very enigmatic, subtle percussion. In the fat grooving "Inside The Screen/Scream" Annabelle can bring the really special and harsh Rock`n\'Roll retro sound of her Kay guitar to the front; more acoustic may not sound electric strings. "Say It Right" makes the unspectacular, inspired by folk finale. The music market is flooded with daily unnumbered of new productions. This album by Annabelle Chvostek shines forth from it and is a masterpiece, which succeeds both to set nostalgic and retrospective accents, as well as at the same time to sound modern and to be enthralling. Each song is individually, because of his own statement and shape. Powerful, versatile and immensely talented sung, played excellently. Annabelle Chvostek´s thirst for new horizons has delivered an excellent work.